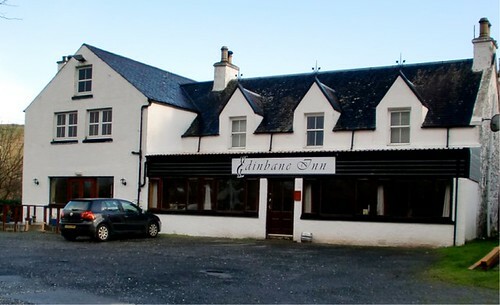 The visitor guide on Dunvegan on Skye with information on and around the place including attractions, sleeping and eating and self catering cottages in Dunvegan. In the northwest of Skye the peninsulas of Waternish (or Vaternish) and Duirinish point out into the Minch towards the Western Isles. 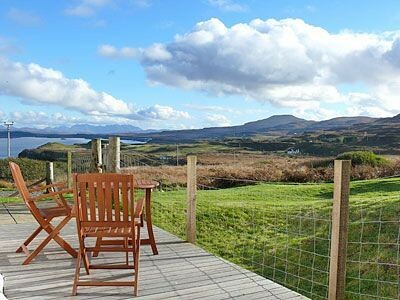 The larger Duirinish peninsula holds more interest for the visitor, featuring the beautiful green valley of Glendale, an area brimming with history, the dramatic walk to Neist Point and Dunvegan Castle, Skye's most famous landmark. The turn-off to this much-visited part of the island is four miles northwest of Portree. The A850 swings west towards Dunvegan, by-passing the tiny village of Edinbane. There's a campsite, two hotels, several B&Bs, petrol station, Land Rover tours with Skyetrak Safari , Tel. 582224, and the renowned Edinbane Pottery workshop and showroom, which is a must for souvenir hunters. Info - Easter-Oct daily 0900-1800. Tel. 582234. The A850 continues west, and those with their own transport and time on their hands might wish to make an interesting little detour at the Fairy Bridge, where the B886 runs north to Trumpan, near the tip of the Waternish Peninsula. If the weather's good (and it is, occasionally) this is the best place to watch the sun set, in a blaze of red over the Outer Hebrides. If there's no sunset, then you could always visit Skyeskins, the country's only traditional exhibition tannery, at Loch Bay, Tel. 592237 or pop into the island's oldest pub, at Stein. 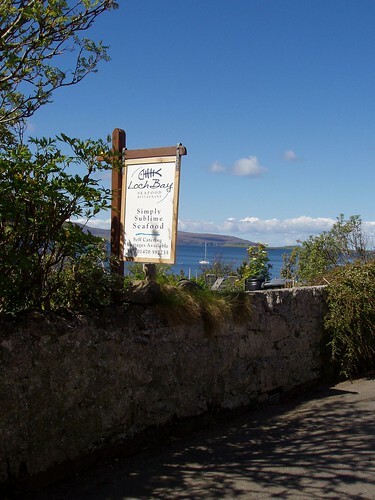 Either way, you should finish off the day with a meal at the wonderful Lochbay Seafood, Tel. 592235 for reservations, where you can almost see your dinner being landed. Mid-range prices, open April-October for lunch and till 2030 (closed Saturday). The ruined church at Trumpan, at the end of the road, has some grisly skeletons in its cupboard. In the graveyard is the 'trial stone'. A hole in the stone was used to test whether or not an accused person was telling the truth. If they could quickly find the hole and stick their arm through it while blindfolded, they were found innocent, but if not, they were guilty. The church is also the starting point for the strenuous eight-mile walk out to Waternish point and back. A few miles further on from the turn-off to Waternish is the little village of Dunvegan. 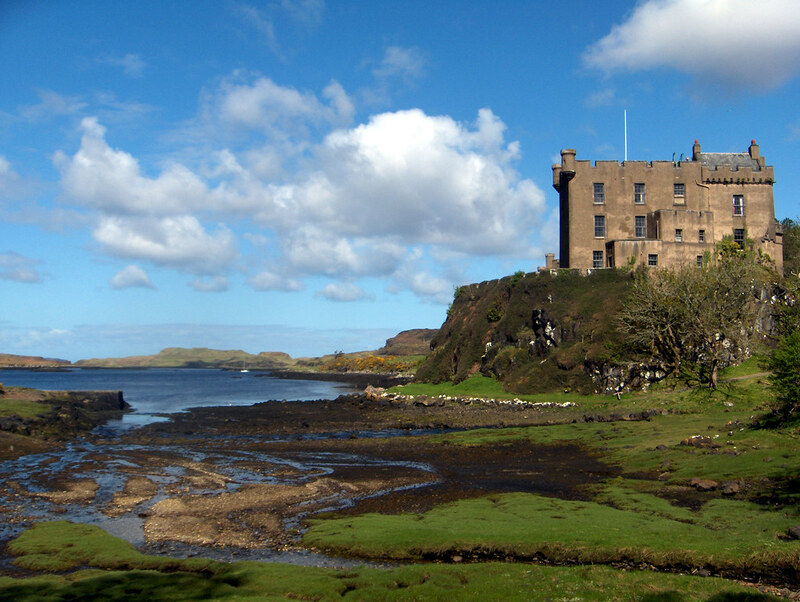 Just to the north of the village is proud Dunvegan Castle, the island's most important tourist attraction. 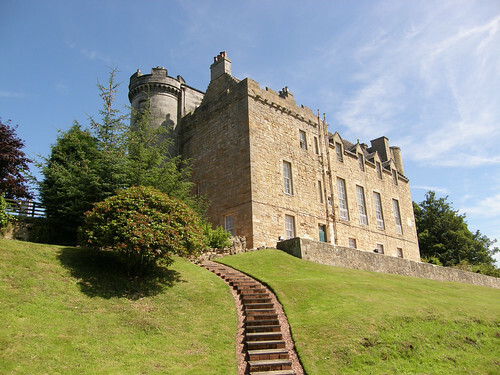 This is the home of the chiefs of the Clan Macleod who have lived here for over seven centuries, making it the oldest inhabited castle in Britain. The present structure dates from the 15th and 16th centuries and, though the Victorian restoration has left it looking more like a baronial house, a look inside reveals its true age. Among the many relics on display is Rory Mor's horn, a huge drinking vessel which the chief's heir must drain 'without setting down or falling down', when filled with claret. There's also a lock of Bonnie Prince Charlie's hair, clipped from his head by Flora MacDonald as a keepsake, but pride of place goes to the Fairy Flag. The flag has been dated to between the fourth and seventh centuries and is made of Middle Eastern silk. It is said to have been given to the clan chief by a fairy, and has the power to ensure victory in battle for the clan on three occasions. It has been used twice so far. The lovely castle gardens lead down to the lochside jetty, from where you can take a seal-spotting cruise or a boat trip around the loch. There's also a busy restaurant and gift shop by the castle gates. A bus leaves Portree at 1000, arrives at the castle at 1048 and returns at 1252 (March-October only). Info - Mid-Mar-Oct daily 1000-1730. Tel. 521206. In the village of Dunvegan is the Giant Angus MacAskill Museum, housed in a thatched, whitewashed cottage, which relates the life story of the tallest ever Scotsman, Angus MacAskill, who grew to 7 ft and 9 ins tall. He emigrated to Novia Scotia and toured the United States with the midget General Tom Thumb, who is said to have danced on his outstretched hand. More interesting than the museum, though, are the stories of its owner, Peter MacAskill, in particular the one about the replica coffin, which is worth the admission fee alone. Peter is a descendent of Angus and also runs the museum at Colbost. Info Mar-Oct daily 0930-1830. Tel. 521296. West of Dunvegan is the Duirinish Peninsula. 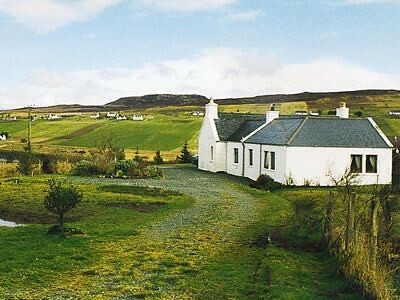 The northern half is populated along the western shores of Loch Dunvegan and in the beautiful and green Glendale, an area brimming with history but with hardly an island family left. Glendale is now dubbed 'Little England', owing to the large number of incoming settlers from the south. The area is famed throughout the Highlands and Islands, for it was here in 1882 that local crofters, spurred on by the 'Battle of the Braes', resisted the cruel and petty tyranny of their estate manager. The authorities sent a gunboat to deal with the uprising and arrested the ringleaders, some of whom were imprisoned in Edinburgh and became known as 'the Glendale Martyrs'. This episode sparked a radical movement throughout the Highlands and led to the Crofter's Holdings Act of 1886 which gave the crofters a more secure tenure and fair rent. The uninhabited southern half of the peninsula is dominated by the flat-topped hills, Healabhal Bheag (1,601 ft) and Healabhal Mhor (1,538 ft), known as Macleod's Tables. The Glendale Visitor Route is signposted from just before Dunvegan village and leads westwards along the shores of the loch and across the peninsula. There are several interesting little sights along the way. Those interested in finding out more about crofting on the island should head for the Colbost Croft Museum, housed in a restored 'black house' and with a peat fire burning and an illicit still out the back. 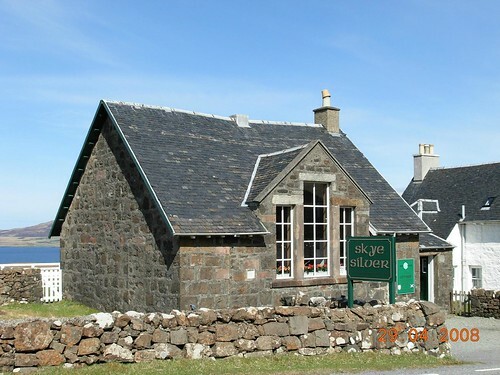 The museum is 4 miles from Dunvegan on the B884 to Glendale. Info - Daily 1000-1830. £1, children free. Tel. 521296. A little further on is Skye Silver, where you can buy silver jewellery in traditional Celtic designs. Info - Daily 1000-1800. Tel. 511263, www.skyesilver.com Further north is the Borreraig Park Exhibition Croft, which features a huge display of farm equipment from days gone by. Info - Daily 0900-1800. At Borreraig is the MacCrimmon Piping Heritage Centre, a fascinating place which is more of a shrine to the famous MacCrimmons, who were hereditary pipers to the Macleod Chiefs and the first composers, players and teachers of piobaireachd (pibroch), which can be heard in the museum (there's an annual recital at Dunvegan Castle in early August). Opposite are the ruins of the ancient piping college. Info - Daily all year 1000-1700. Tel. 511369. Moving from the sublime to the ridiculous, in the village of Glendale is a Toy Museum, which should appeal to kids of all ages. Info - Mon-Sat 1000-1800. Tel. 511240. The B884 continues west, then a road turns off left for Waterstein. At the end of this road (just over 2 miles) is a car park which is the starting point for the walk out to the lighthouse at Neist Point, the most westerly point on Skye and one of the most pleasant walks on the island. It's about 1€ miles there and back and well worth the effort. The path is easy to follow and the views of the sea cliffs are wonderful. There are lots of nesting seabirds around and you might even spot whales offshore. The lighthouse, built in 1909, is now unmanned, and you can stay in one of the Skye self-catering cottages, Tel. /Fax. 511200. The graveyard at the lighthouse looks real enough but take a closer look and you'll see the names of the film crew who worked on the superb 1997 film, Breaking the Waves. 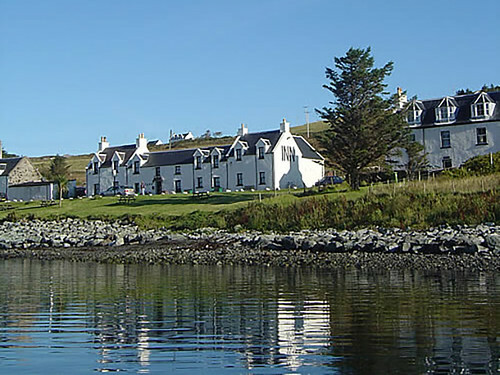 Inn on the road around North coast of Skye from Portree to Dunvegan with bar and food from local suppliers. Live music some nights. Good stop for travellers. Small pub in village of Stein overlooking the loch on Waternich Peninsula. The only place to drink for miles. Supposedly the old inn on Skye! Next to the Colbost Croft Museum is The Three Chimneys, Tel. 01470-511258, www.threechimneys.co.uk, considered by many to be the best restaurant in the north of Scotland and, judging by the numerous awards they've won, that judgement can't be far wrong. Local seafood, meat, veg and dairy produce and a great wine list. Open daily 1230-1400 (except Sun) and 1830-2130; expensive. They also now have accommodation a few yards away at The House Over-By (6 rooms). 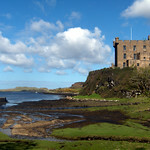 A ground floor apartment a mile from Dunvegan on the Isle of Skye Sleeps 2 people in one bedroom. 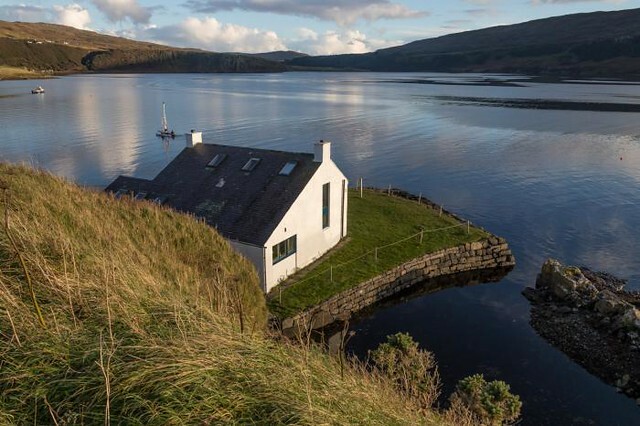 Lovely house on West Coast of Skye on Loch Vatten in remote setting. Superb views. 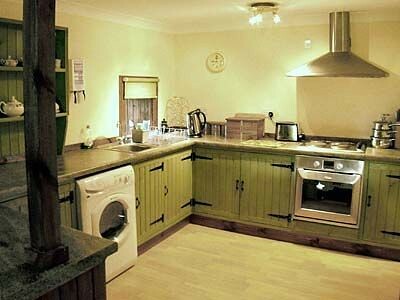 2 Bedrooms inc 4 poster sleeps 4. Wifi & 1 Dog welcome. 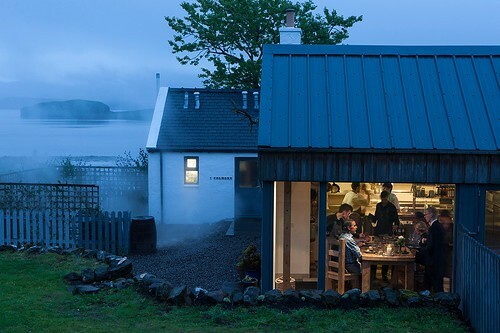 Modern cottage in Colbost opposite Dunvegan on the Isle of Skye. Sleeps five people in three bedrooms.